Click for 2013 Performance dates and for the Artists' bios. 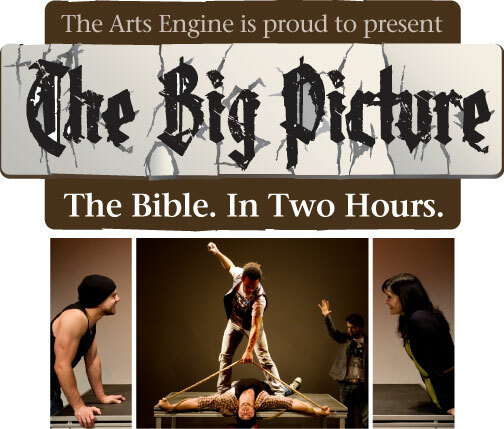 The Big Picture, by Toronto playwright Dennis Hassell, is a stirring, epic drama that tells the story of Gods relationship to humankind as it is told in the Bible. The sweeping narrative arc of this monumental play follows Gods promise to humanity, starting with creation, through the Old Testament, to the gospel of Jesus and right through to Revelation. And it all happens imaginatively in one theatrical event. The foundational stories of the Bible are distilled into this compelling and stunning theatrical experience, that has garnered rave reviews from critics and audiences across the country. Originally produced by Brookstone Performing Arts, the play had a professional theatrical run in Toronto and toured nationally under the sponsorship of the Canadian Bible Society. In 2013 The Arts Engine toured the play in British Colulmbia, Alberta, Ontario and New Brunswick. Becoming part of the next Big Picture Tour is simple and affordable. Two options are available for you to present this professional production to your community. For details, contact Tom Carson at tom@theartsengine.ca or 416-937-6102. Photos above by Tara Whittaker.